Coffee, like wine, has a lot of different flavors in it. Sometimes it takes a while to identify each of those flavors and you have to go through a mental checklist to look for things like nutty, earthy and caramel elements. 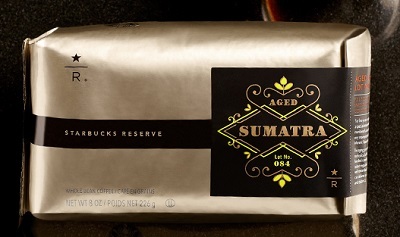 There are other times when the flavor jumps right out at you, and that was what I found to be true with my current favorite Starbucks Reserve coffee, Aged Sumatra Lot No. 084. At the first sip, I tasted hot buttered toast, on very well-toasted bread. It was rich and velvety in my mouth and I was surprised at how much that butter flavor stood out! By the second sip, I began to get more earthy notes and some of the butter began to fade into the background. The coffee is extremely smooth and satisfying, with a low acidity and a lot of body. I always look forward to aged Sumatran coffees when Starbucks brings them out, ever since I tried their first offering a few years back. This particular coffee is aged 5 years, and that aging process is what contributes to the rich, complex and smooth flavor profile that you find in these types of coffees. It’s both easy to drink and something I want to savor.